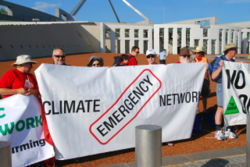 In February at Australia's Climate Action Summit, people from [[climate change groups created and launched a cohesive and strategic national climate campaign, formed a national grassroots network, and sent a powerful message on the eve of the second year of the Rudd Government that sets the agenda for urgent climate action. 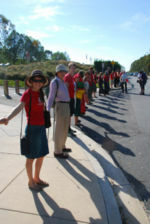 Community climate action groups from across the continent joined together in Canberra, the weekend before the first day of the 2009 Federal Parliament. In 2007, Kevin Rudd was elected to government in the world's first climate change election. One year on, we are still waiting for the urgent action needed to peak our greenhouse gas emissions and begin this urgent transition to renewable energy. In December 2009, Kevin Rudd will meet with world leaders in Copenhagen, to set the framework and benchmarks for future global action on climate change. We need to ensure the Australian Government goes to Copenhagen with the strongest commitment to reducing greenhouse pollution and averting runaway climate change. At the summit there two days of facilitated meetings and workshops to build a unified national climate campaign, and one day of dynamic training in climate campaigning skills for taking action, facilitating climate action groups, and effective lobbying. 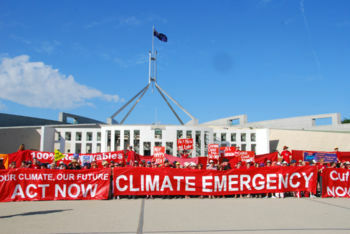 On the first day of the 2009 Australian Federal Parliament, thousands of people were mobilised in a high profile demonstration for real action on climate change by encircling Australia's federal parliament. Over 140 community climate action groups united at their first national summit in their decision to oppose the Federal Government’s proposed Carbon Pollution Reduction Scheme (CPRS), saying that it will fail make the required cuts to greenhouse pollution. 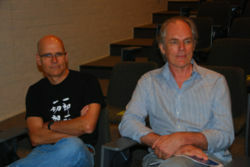 More than 500 people from around the country gathered in Canberra on on three days from 31/1/09 to 3/2/09 to produce a national, unified set of objectives for the community campaign of climate action for the crucial year ahead. “Australia must be part of a global climate change action plan that will reduce carbon concentration in the atmosphere to 300 parts per million (ppm) and keep it there,” said mother and member of Climate Change Balmain Rozelle Jenny Curtis. Prevent the CPRS from becoming law as it will fail to make emission cuts necessary to stop the climate emergency. Build community-wide action to demand green jobs, a just transition for industry workers and 100% renewable energy by 2020. Aim for stabilisation at 300ppm CO2 in the atmosphere and strong international agreement in line with what science and global justice demands. This page was last modified 12:58, 18 March 2010. This page has been accessed 30,176 times.